Long Beach Schools - Common Core: Testing with "Smarter Balanced"
The Smarter Balanced Assessment Consortium (Smarter Balanced) is a state-led association working to develop next-generation assessments that accurately measure student progress toward college- and career-readiness. 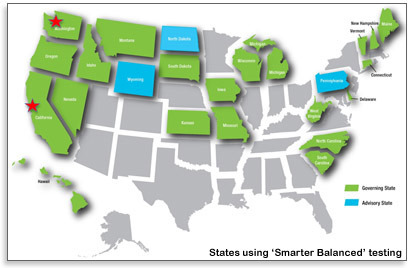 Smarter Balanced is one of two multistate consortium awarded funding from the U.S. Department of Education in 2010 to develop an assessment system aligned to the Common Core State Standards by the 2014-15 school year. The other consortium is called Partnership for Assessment of Readiness for College and Careers (PARCC). Read more about the differences between the two consortia. This handout gives an overview of the CCSS and SBAC. What Will Smarter Balanced Assessments Mean for Me? This one-page handout will present benefits as a student, parent, teacher, or policymaker. This one-page handout explains the core components of the assessment system. For more information, check out the FAQ page. You can also visit the Smarter Balanced Assessment webpage to learn more. These specifications, developed by the Smarter Balanced Governing States, were used by K-12 teachers and higher education faculty to write and review assessment items and performance tasks. They provide guidance on how to translate the Smarter Balanced Content Specifications into actual assessment items. Additionally, guidelines for bias and sensitivity, accessibility and accommodations, and style help item developers and reviewers ensure consistency and fairness across the item bank. The Smarter Balanced assessment system includes a variety of item types. The response formats included in the sample items will be updated based on findings from cognitive labs and small scale trials being conducted this fall, as well as additional information gathered during pilot testing in early 2013. Selected-response items prompt students to select one or more responses for a set of options. Technology-enhanced items take advantage of computer-based administration to assess a deeper understanding of content and skills than would otherwise be possible with traditional item types. Technology-enhanced items capitalize on technology to collect evidence through a non-traditional response type, such as editing text or drawing an object. Selected-response and technology-enhanced items can be scored automatically. Constructed-response items prompt students to produce a text or numerical response in order to collect evidence about their knowledge or understanding of a given assessment target. Performance tasks measure a student’s ability to integrate knowledge and skills across multiple standards – a key component of college and career readiness. Performance tasks will be used to better measure capacities such as depth of understanding, research skills, and complex analysis, which cannot be adequately assessed with selected- or constructed-response items. The Smarter Balanced assessment system will provide accurate measures of achievement and growth for students with disabilities and English language learners. The assessments will address visual, auditory, and physical access barriers – as well as the unique needs of the English language learners – allowing virtually all students to demonstrate what they know and can do. The Smarter Balanced assessment system uses technology to deliver assessments that fit the needs of individual students. Items and tasks will be associated with a variety of accessibility tools and accommodations that can be delivered to students automatically based on their profile. Accessibility tools include, but are not limited to: foreground and background colors; tactile presentation of content (e.g., Braille); and translated presentation of content in signed form and select languages. Online delivery of Smarter Balanced assessments ensures that students can take a test individualized to meet their needs at the same time as their peers. 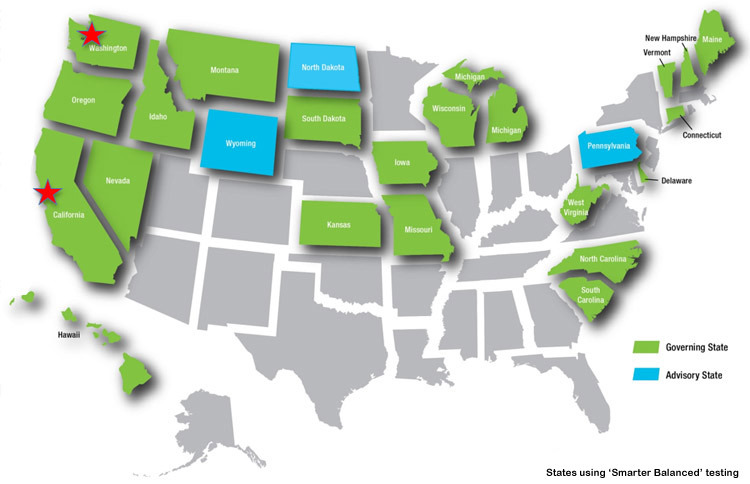 SBAC is working with educators, students, and experts in the field to design and test the assessment system. In addition to a state-led Accessibility and Accommodations Work Group, the Consortium works with advisory panels on English language learners and students with disabilities to ensure that the assessments are developed under principles of Universal Design and research-based best practices. Learn more about Smart Balanced Accessibility and Accommodations or visit the Support for Under-Represented Students webpage. The Smarter Balanced assessment system will use Computer Adaptive Testing (CAT) for much of the assessments. This type of testing format supplies students with questions based on responses to previous questions. Based on the student’s response, the computer program adjusts the difficulty of questions throughout the assessment. For example, a student who answers a question correctly will receive a more challenging item, while an incorrect answer generates an easier question. By adapting to the student as the assessment is taking place, these assessments present an individually tailored set of questions to each student and can quickly identify skills students have mastered. This approach represents a significant improvement over traditional paper-and-pencil assessments used in many states today. Some assessments have the ability to provide a more detailed picture of where students excel or need additional support, helping teachers to differentiate instruction. CATs are typically shorter than paper-and-pencil assessments because fewer questions are required to accurately determine each student’s achievement level. The assessments draw from a large bank of questions, and since students receive different questions based on their responses, test items are more secure and can be used for a longer period of time. CAT offers teachers and schools a more accurate way to evaluate student achievement, readiness for college and careers, and to measure growth over time. For more information view the CAT Handout.